The Toubkal Circuit Trek (6Day), Morocco consists of 6 days trekking in the Atlas Mountains, combining beautiful panoramas with the time to explore Berber villages and culture. From the first day of trekking you will be immersed in everyday Berber life watching the locals working in their terraced fields and tending to their animals. 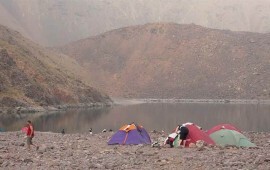 This itinerary involves early starts and strenuous trekking days, moving from camp to camp each day but you will be rewarded with many fine photo opportunities, in particular at the summit of Jebel Toubkal 4167m. At the end of the day you will be able to relax in village cafes and enjoy a cup of mint tea or paddle alongside refreshing rivers and the turquoise shores of Lac D’ifni 2295m. In Marrakech you can visit the De Jemma el Fna of Marrakech and explore the medinas and souks whilst shopping for your souvenirs. Transfer from Marrakech to Oukaimeden after breakfast (1 hour and 40 minute drive). Meet a mule to load your baggage and start the trek to Tacheddirt via the Assif Imnane path. Spend the night in the beautiful village. Start the climb to the Tizi n-Likemt (3555 m). Enjoy the spectacular view of the multi-colored hillsides and rocky peaks. Climb for about 4 hours to the pass and take a nice break for a picnic lunch. Then go down to the sheepfold of Likemt (2600 m), and descend onto high pastures alongside a stream where you can take a refreshing bath. 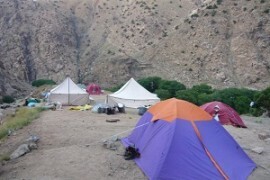 Camp overnight. Day 3: Azib Likemt – Amsouzerte Approx. 6hours walking time. Continue heading southwards and follow the Assif Tionzart stream. Pass through a series of pools and gorges until the valley opens up and you reach a beautiful high meadow beneath the windy peak of Tizi-n-Ourain (3109 m). Admire the green valley below and the massive summit of Toubkal as you pass through charming villages and finally arrive at the village of Amsouzart (1800 m), where you will spend the night. Day 4: Amsouzerte – Lac d’ifni Approx. 4 hours walking time. Start trekking up through a green and beautiful valley towards the Ifni Lake. Go past charming villages and enjoy lunch on the shores of the lake. 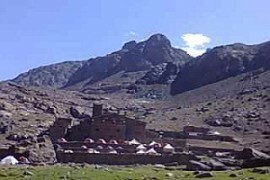 Then on to its western end to continue towards the Tizi Ouanoumss peak (3250 m). Follow the upper valley of Assif Mousairne until you reach the spectacular pass crossing the Atlas. Day 5: Tizi N’Ouanoumss – Toubkal refuge Approx. 5 hours walking time. Climb up to Tizi-n-Ouanoumss (3650 m), situated between the two highest peaks of the Atlas: Toubkal and Ouanoukrim. As you turn north, walk down the to the upper part of the valley of the Mizane River where you will arrive at the Neltner refuge, a brand new mountain hut built by the French Alpin Club. 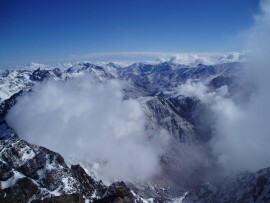 Day 6: Refuge of Toubkal – Toubkal Summit – Imlil Approx.8 to 9hours walking time. After an early breakfast, set off eastwards to pass between two guardian rocky peaks until you reach a high corrie, Reach the peak after 3 hours, and enjoy the spectacular views of the Anti Atlas peaks and the Sahara to the south, Make a 2 hour descent to the hut and down to the village via the holy hamlet of Sidi Chamharoush and meet your transport to return to Marrakech.